I know most of the readers who landed on this blog post must have tried to earn money online or is looking for any way to earn money online. When I was in my teens I too had been looking online for different ways to make money online like you people are doing right now. The Internet is a big ocean where Billions of Dollars of transactions take place every day and its very easy to get lost in this ocean to make money on the internet or get in the trap of online scams. The internet just as holds legit ways to earn money it also has major online scams. Just like the ocean has different types and species of aquatic animals the internet also has different methods to make legit money or you could even get drowned in the online scams. Don’t worry because before you even start looking for anything I’ll tell you how to easily spot online scams. Important note: This post is just a descriptive way to help you understand how to detect online scams and is mostly meant for newbies or amateurs. How do I know about Online Scams? Newbies and amateurs are easy target for people who scam on the Internet because these people write a seducing and well versed description of product they are scamming. One best example of scam is this website here which claims you can earn $1500 in a week just by spending 5 minutes on the site everyday, it claims to provide $25 as signup bonus and pays you $5 for promoting the website. That’s just one example but such kind of sites are all over the internet so the question does arises in everyone’s mind; how to detect online scams? 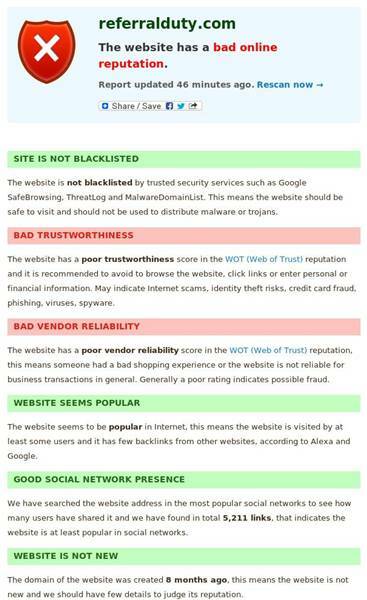 There are different websites that can tell you if a particular website is scam or not; one example of such sites is scamvoid.com which tells you if a website has a good or bad online reputation. The snapshot of result shown for above website is posted below. Method Two is simple and easy but sometimes might not be accurate. Its just checking on Google. All you need to do is type a string in the search box as ‘website name + scam’ (without the quotes) and you’ll have reviews of people on forums who might have tried it and were possibly scammed. Just to save your time I had done Google search for referralduty.com and the first website hosts complaints from its various users. You can view the complaints on Scambook.com and check that most of the complaints are similar which claim the website is just one of those online scams. Check if any website is asking money to pay upfront just for registering or to start using their website. If it asks to pay a signup fee to start earning money online is surely part of those online scams. 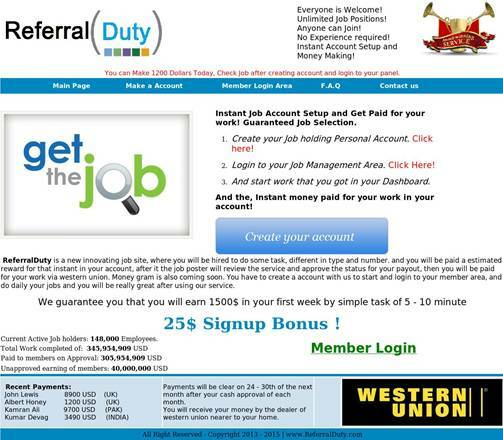 Does the website claims you can earn $1000 within a week or says you can earn $5 – $10 just for sharing links on social networking websites or earn $50 on referrals and such kind of stuff then its one of those website included in the list of online scams. Read terms and conditions carefully before taking steps forward. this topic to be actually something which I feel I’d by no means understand. I’m taking a look ahead in your subsequent post, I will attempt to get the hang of it! I appreciate your giving a constructive criticism comment. I’ll review this post again and make it more friendly so any even a 12yrs old boy can understand it.